“You make me wanna…Shout!” (The Isley Brothers) The lack of homes for sale on the market may be causing some would-be buyers to shout these days. But what about the rest of the week’s news? 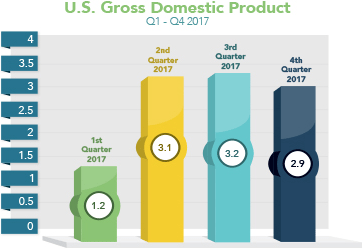 Fourth-quarter 2017 Gross Domestic Product (GDP) edged lower to 2.9 percent, down from 3.2 percent in the third quarter, the Bureau of Economic Analysis reported. However, the report showed that consumer spending rose 4 percent, up from 2.2 percent in the third quarter. The jump in consumer spending was the quickest pace since the fourth quarter of 2014. Consumer spending makes up two-thirds of economic activity and is a key driver of economic growth. Home prices continued to rise in January due in part to the low amount of homes for sale on the markets. The S&P/Case-Shiller 20-City Home Price Index rose 6.4 percent from January 2017 to January 2018, up from 6.3 percent recorded from December 2016 to December 2017. Home prices were also up 0.8 percent from December to January. Inventory continues to be a real challenge for many would-be buyers. Currently, there is a 3.4-month supply of homes for sale, well below the 6-month supply that is seen in a healthy market. Consumer inflation remained low in February. The Bureau of Economic Analysis reported that Personal Consumption Expenditures (PCE) and Core PCE rose 0.2 percent from January to February, both in line with estimates. The more closely watched Core PCE reading excludes volatile food and energy prices and February’s figure was just below the 0.3 percent recorded in January. From February 2017 to February 2018, Core PCE came in at 1.6 percent, just above the 1.5 percent recorded in January. However, the reading is still well below the Fed’s target range of 2 percent. When inflation starts to rise, a rise in home loan rates can follow. Inflation reduces the value of fixed investments like mortgage bonds, and home loan rates are tied to mortgage bonds. The labor sector will be front and center as the March Jobs Report could be a market mover. Manufacturing data from the ISM Index will be released Monday with the ISM Services Index reported on Wednesday. The first of two key labor market reports will be delivered Wednesday from the ADP National Employment Report. Look for weekly Initial Jobless Claims on Thursday. On Friday, the Jobs Report for March will be released, which includes Non-Farm Payrolls, the Unemployment Rate and Hourly Earnings. If you or someone you know has any questions about home loans, please reach out. I’d be happy to help.